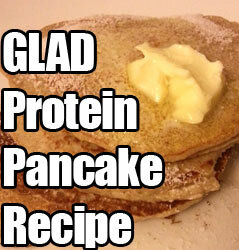 Hot on the heels of publishing the new, simplified, and improved GLAD diet, I give you….The GLAD Protein Pancake! Real quick and easy to make. This batch delivers 32g of protein, and there’s no protein powder involved! Flavoring like cocoa, vanilla, or cinnamon. 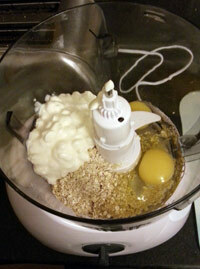 Blend them up in a food processor or mix it together manually. While a low-fat version wouldn’t taste as nice, you could use low-fat cottage cheese and 5 x egg whites if you really wanted to. 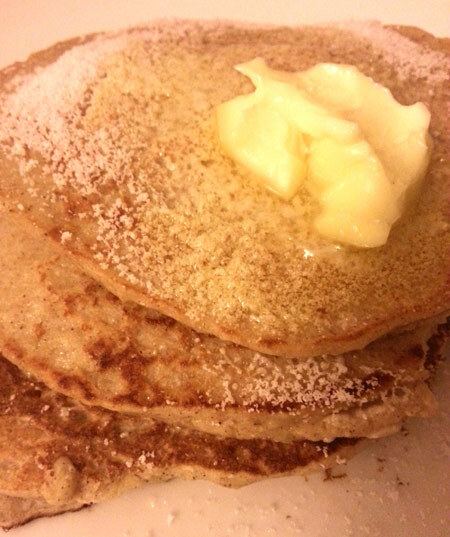 I decided to make 4 x smaller pancakes from this batch, as opposed to 2 x large ones. 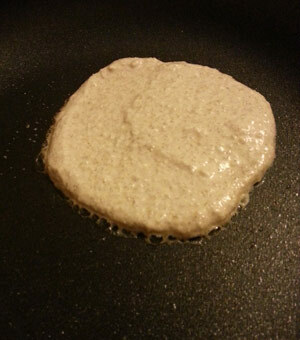 Here’s a pic of the batter cooking. Once you cook them up, you can add whatever you want. Fruit, sugar-free syrup, anything that is low or no sugar is GLAD-friendly. You can, but it will taste a little dryer. The good news is that it will increase the protein content and you can make it whatever flavor you want. 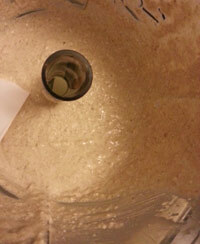 If you decide to add whey, reduce the oats accordingly. So you might use 30g whey (1 scoop) and 35g oats (1/2 cup). If you try a variation of this, let me know how it works out below. Thanks for the recipe Mark. Adding some nuts and honey made it even better 🙂 .. Loving it ! Is this a M.A.N.S. friendly recipe as well or just for the GLAD diet? @Ken. If you went low-fat, you could have it on the high-carb phase of MANS. Too high in carbs for the low-carb part, though. Isn’t the GL on this kinda high? Excellent! I’ll try it on the high carb portion of the diet then. I gotta say, although I’ve only been on the MANS diet for under a week now, my cravings for sugar are almost gone. The wife brought home my favorite ice cream last night and I wasn’t even interested! Dudes look at me funny at the gym too. They see me doing slow contractions and they shake their heads, but I’m making consistent gains while they look the same week in and week out. Thanks for your help! @Ken. Very typical response regarding the cravings. People that are addicted to sugar would do well to go low-carb at least for a while to break the habit once and for all. If I can use this on glad, do I still need to watch my GLs per meal, even though you say there is no need to count GL? I assume if GL is too high per meal then it totally negates the purpose of the glad diet ? Saturday morning breakfast here I come, cheers Mark. Once again striving forward with new recipes to help us out! @Nathan. It would but you gotta pay attention to the 5 rules above – it’s gonna be damn hard to go too high in GLs if you stick to the rules. Mark, what do you think of using steel cut oats for this? 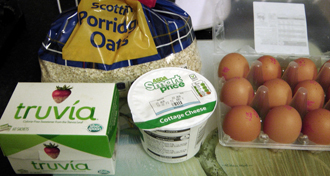 They are more healthy than rolled oats…but I am not sure if they can be used as a substitute in this recipe. What do you think? @asker. That depends on if you’re gonna use whole eggs and full-fat cottage cheese. Also it varies from brand to brand, so I’ll leave it up to the reader to work out the cals and macros. @Keith. Shouldn’t a prob at all. You’ll have to blend them up anyway. Plus when you cooked them, it’ll prob turn out the same. @Kiky. That’s a tough one. You could try xanthan gum, a fiber that helps bind ingredients. 65g is gonna be 4 or 5 at most. 180g cottage cheese about 3. Eggs are 0. I’d estimate a GL of around 3-5 for this meal. Very low. Is there a mathmatical was of finding how much protein and fats effect a Gylcemic Load on a food? – 3 whole eggs (The 3rd egg was used because the mixture was so dry before). 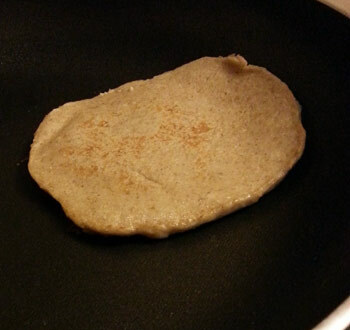 It tasted like a pancake in my opinion, but might use slightly less oats next time. 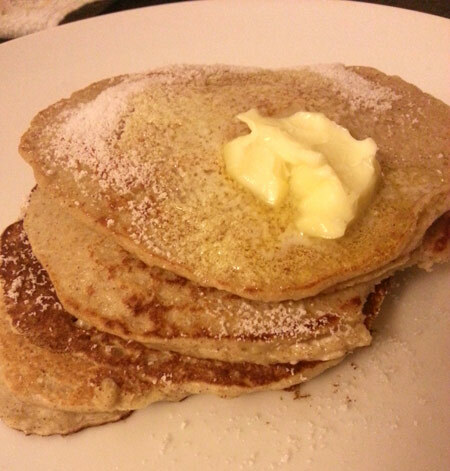 Still have enough left for a couple more protein pancakes in the fridge, so may try it again for breakfast tomorrow. In contrast the other half had 1 mouthful then spat it out, she really wasn’t keen on it. Hi Mark, I’ve recently become a qualified PT and just wanna let you know that your website had me light years ahead of the other students during the course, and it has also had a large influence on the way I train and the advice I give to clients so thanks for everything! @krs. No, there’s no formula unfortunately. @Michael. Yeah I have a comment – she’s wrong lol. She obviously doesn’t understand what GL really is. Yeah recommend both so people can have their choice of what suits their taste and lifestyle. They’re both equally effective. haha thanks Mark, I’m guessing she hasn’t read up as much as you on the subject and tries to force her views a little, it puts my mind at ease reading your articles because you back up everything you say! Thanks again for the replies.